Researched and compiled by Resoum Kidane; with contribution by Mamanesrit Idris. Mahmoud Ibrahim Muhammad Saeed (Chekini was born in Keren in 1940 from the Habab tribe of Betasghade family and his great grandfather is kentebay Gergis. Chekini completed his elementary and junior education in Keren, thereafter he moved to Asmara to purse his secondary education at Jalia Arabic secondary school. During his student time he was a good footballer in Keren as well as in Asmara. In the 1950s the youth’s resistance against the violations of the Federal Constitution intensified when Amharic became the official language in violation of the Eritrea Constitution which had declared Tigrinya and Arabic as the medium for primary education up to grade four, along with English. During those years secondary school students were also influenced by Ato Woldeab Woldemariam radio programme which was broadcasts from Cairo. The radio programme played a great role in the revival of Eritrean nationalism in the 1950s. Consequently sporadic student strikes became common, especially in Asmara in the 1950s. In 1957 the generation of Chekini actively participated in organizing demonstrations, in protesting the imposition of Amharic in Eritrean schools as the language of instruction, replacing Tigrigna and Arabic. When Chekini studied at Jalia Arabic secondary school, he was recruited by Haraket (MaHber ShewAte) probably between 1959 and 1960. In the late 1950s it was a common phenomena that when students moved to Asmara to pursue their secondary education to be recruited by Haraket (Mahber Shewate) same as Chekini . One of those students was Naizghi Kiflu who came to Asmara from Medefera to purse his secondary education, and became a member of the secret organization known as MaHber ShewAte. It is worth mentioning that in the early 1963 Syria was one of the first foreign supporters of the ELF. According Michael (2014) twenty ELF fighters got military training in Syria as early as 1963 and completed their training in 1964. Dan Connell (2010) also states that in 1960s approximately 300 Eritreans received military training in Syria . Chekini was one of those fighters who went to Syria for military training at the Military Academy in the Syrian Arab Republic. Based on information obtained from Chekini’s daughter, he was sent for military training to Syria in 1964, after the first batch returned in 1964. Chekini probably returned from Syria in 1965 when the Supreme Council of the ELF leadership deliberately divided the Eritrean Liberation Army by region and ethnicity through establishing four military zones based on a territorial division in order to control the movement of the fighters and to divide them, weakening the unit which they had built up during Haraket This new military structure instead of minimizing internal disputes, exacerbated the ethnic, religious and personal conflicts, resulting in intensive rivalry between different zones which was cause of inefficiency and disunity among the Zone Commands. This period of division in the history of the Eritrean armed struggle (1965-1968) is called Zemene Kiflitat. Based on territorial division, Chekini who was from Senhit became the political commissioner of Zone Two which represented Sahel and Senhit, the commander of this zone was Omer Hamed Ezaz from Bilen Bet Tawqe family in Hal-Hal. After serving for two years as the political commissioner of Zone two, Chekin and four other political commissioners from Zone one, three, four, and five went for further military training to China in 1967. (Larkin, Bruce D, (1971) provides a brief explanation of how the Chinese Communist Party offered this military training for the ELF fighters. According to Larkin, in 1966 at the Afro-Asian Writers’ emergence meeting which was held between 27 June and 9 July, it was resolved to give full support to the “Just war of liberation of the Eritrean people for national independence and sovereignty. A year after this meeting as mentioned earlier, the ELF sent five fighters to China to study political ideology and guerrilla warfare at the Nanjing Military College in China, 1967. In this picture Mahmoud Ibrahim Chekini standing left to right between Isaias Afwerki and Ramadan Mohammed Nur, other ELF fighters Ahmed Adem Omer. Sitting L-R: 3rd Ahmed Ibrahim Ahmed. According to his daughter, Chekini also founded the first a music band on the frontline in 1969, which could have been when he returned from China. During that year he was also elected to be a member of the General Command (Kiyada-al-Ama) at the Adobha Conference in 1969. At the Adobha conference all five Zones joined into one united army and a new leadership called the General Command (Kiada al-Ama). This leadership was formed to replace the Cairo-based Supreme Council and the Revolutionary Command liaison in Kassala. In reaction to the General Command (Kiyada-al-Ama) decision to replace the Cairo-based Supreme Council, Osama Salhi Sabbe who was member of the Supreme Council and supporter of Zone Four or the Eastern lowland region spilt from the ELF. According to (Iyob) Sabbe announced the formation of a new body the General Secretariat (GS) to replace the discredited Supreme Council. The General Command (Kiyada-al-Ama) refused to acknowledge the General Secretariat (GS) and responded by arresting fighters suspected of being adherents of Sabbe and launching a repressive campaign over the eastern lowland (ZONE FOUR) which were viewed as a Sabbe stronghold. After Sabbe split the ELF-General Command held its first National Congress in Arr, Barka between 14 October and 12 November 1971 and elect Idres Mohammed Adem chairman who was the main rival of Sabbe. Chekin was also elected to members of the other 19 person Executive Committee by 1st ELF Congress in 1971. At the ELF first congress, 1971, the ELF changed its name to the ELF-RC and declared that the Eritrean revolution cannot tolerate the presence of more than one armed organisation in the field. The ELF-RC denounced the dissidents as “counter-revolutionaries”. The ELF-RC declared war to liquidate “the counter-revolution” by force which was the cause for two years of civil war. The civil war of 1972-1974 erupted as a result of the rivalry for power between the ELF and EPLF leaders. A battle between the two fronts at Wolki in October 1974 left 600 fighters dead . The two years [1972-1974] of internecine strife between the two movements, caused an estimated 3,000 casualties among the fighters - more deaths among the combatants than the entire thirteen years of government military actions to date ( Waal 1991). The civil war between the rival ELF and EPLF leaders was also used to eliminate their opponent under the pretext of then being martyred in the civil war. 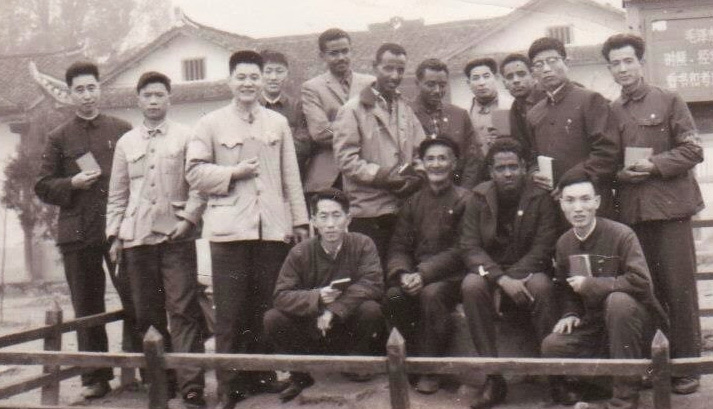 According to the ELF, Mahmoud Ibrahim Muhammad Saeed (Chekini) who went to China for training with the first group was killed (martyred) during the first Eritrean civil war. However, according to a reliable source Chekini was murdered in the Sahel, 1972. In 2018 also received similar information about his mysterious death from Mamanesrit (Chekini’s daughter), who totally believed that, her father was assassinated by a friend in April the 13th 1972 in the Sahel Tuku'e Yehadego who was co founder of Mehaber Showat in Asmara was also one of the victim of the EPLF who was eliminated under the pretext of being martyred during the civil war. There was also a similar story about Dr. Fitsum who was shot by his friend in 1972. He joined the ELF from Yugoslavia after passed his PhD in the early 1970s. Dr. Fitsum was a member of the ‘other’ 19-person Executive Committee Elected by 1st ELF Congress in 1971 and against the civil war like Chekini. I think because both of them had different views from others ELF leaders; eventually they became the scapegoat of the ELF leadership. Checkini’s daughter adds that those who have conspired in the assassination of Chekini are alive and live in Stockholm, Sweden. She tried to investigate why he was murdered and asked a few people but they didn’t want to say anything. According CHEKINI’s daughter he left a testament with unkown person. The mysterious circumstances of the death of Mahmoud Ibrahim Muhammad Saeed (Chekini) are similar to the death of Tuke who became the victim of his own organization, the EPLF. As can be seen from the table below they had similar lives. To conclude, as can be seen from the above picture family members of Chekini strongly believe that he was assassinated by his organisation the ELF. I became aware of Chekini assassination in 2007, when I received an e-mail with brief information along with his picture from his niece. In 2018, I again heard a similar more detailed account from his daughter which I decided to include in this document on his mysterious death. 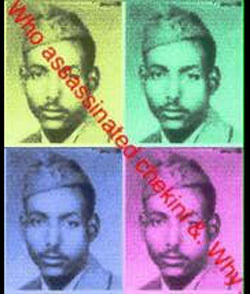 In the history of the Eritrea Revolution, there are still questions to be answered about ELF and EPLF fighters who were killed in suspicious circumstances.Some of them were very well-known liberation fighters: Abraham Tewolde, Tuku Yihedogo, Weldenkel Haile (Wedi-Haile), , Isayas Tewelde ( Wedi-Flansa), Fisehye Woldegebrel . and Ibrahim Afa from the EPLF side . Dr Fistum, CHEKINI from the ELF side. The mysterious death of veteran fighters like Ande Michael Kahassa did not begin after liberation by the PFDJ but has roots going back to the 1960s and 1970s. Leaders of the ELF and EPLF along with their collaborators who have been involved in eliminating innocent fighters during the liberation era will be harshly judged history!